Today was the big interviewing day, it was also a very windy and wet day (this made me happy as it was like winter in the UK). For my cultural pieces about Iceland I am doing a story on Street Art in Reykjavík and another on Feminism due to its success here in comparison to the rest of the world. I interviewed some lovely women all of which said some great things about their respective topics and I look forward to editing them down to the final pieces, which will be available here soon! First up for the evening reviews was Snooze Infinity, a 22-year old Reykjavik native who produces house and garage tracks with pumping bass and self described “unconditional love.” He’s released just one EP, Didn’t Know/Beam, but has several tracks on Soundcloud. Certainly one to watch in the electronic scene. The performance began with slow ambient electronica, a genre with a lot of awful music so it was a nice surprise to see it being done so well. 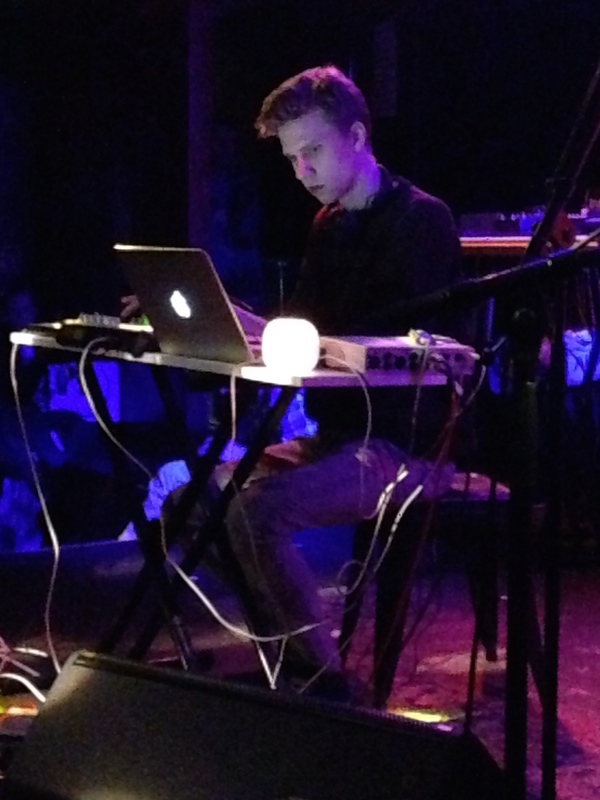 The performance was mixed live on a loop pad with seamless mixing from track to track. The set went through a journey of genres and moods, starting with chilled electronica and moving through future off-beat Drum and Bass all with excellent and clever percussion. All of the performance was done by candle light on the desk and made for an excellent start to the evening. Next was Bistro Boy or “a little fairy who lives in Iceland” as he likes to call himself. He found his love for electronic music after dropping out of classical piano lessons. His music is self described as “smooth and 1980s rooted with an electronic twist.” Bistro Boy released his first EP, Solheimar, in 2012, his first album, Journey, in December 2013, and most recently his sophomore album, Rivers And Poems, a collaboration with Japanese ambient/drone artists Nobuto Suda earlier this year. The performance featured live vocals on some of the more ambient tracks and lots of heavy kick drums and synths throughout the performance as well as a jelly fish on the screen behind. The set contained plenty of rumbling bass and hi-hats as the styles changed towards a gigantic climax and closer. The end of the set featured a monster of a house track with an epic build and climax that perhaps Eric Prydz or Four Tet would be jealous of. It’s hard to describe the final act, DJ FLUGVÉL OG GEIMSKIP, she is a Reykjavik native who makes art and crazy psychedelic, spacey-electronica beats that she sings over. These songs are often accompanied by some of the strangest videos ever. In “Glammur i Geimnum” FLUGVÉL is seen riding a guinea pig on the moon as it is split in half. DJ FLUGVÉL OG GEIMSKIP released her first album, Glammur i Geimnum, this year and has performed internationally. The performance was lively and interesting, showing off the true performer that FLUGVÉL is as she told her stories between the songs with excellent crowd interaction skills. The set featured lots of strange spacey tracks, some of which were quite jarring and seemed gimmicky at times. As the set progressed the gimmicks wore off and the true musician inside came out and played some great songs proving she was more than just a novelty act with bright lights and strange tales. This entry was posted in Daily Blog, Iceland Airwaves, Iceland Airwaves 2015, Live Review and tagged Benedict Jones, Bistro Boy, DJ FLUGVÉL OG GEIMSKIP, Iceland, Iceland Airwaves, iceland airwaves 2015, Live Reviews, Snooze Infinity. Bookmark the permalink.